The San Juan Capistrano community is mourning alongside Long Beach and first responders over its loss of Long Beach Fire Department (LBFD) Capt. 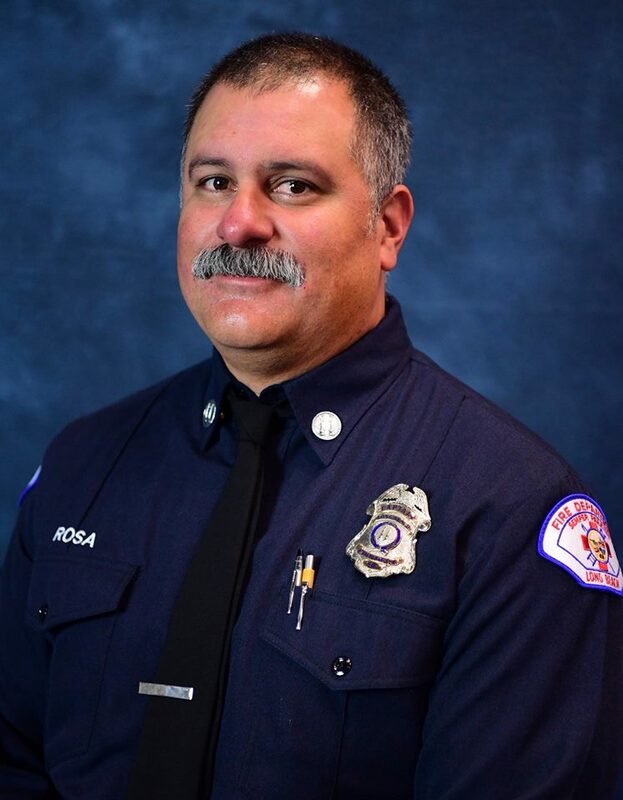 David Rosa, a San Juan Capistrano resident, who was killed by a gunshot wound while responding to an emergency incident in the early hours of Monday, June 25. “At 3:49 this morning, fire units responded to a fire alarm at 600 E. 4th St. in Long Beach, (to) supplemental reports of a fire and an explosion. At 3:51, occupants reported a strong smell of gasoline in the high rise apartment complex,” LBFD Fire Chief Mike Duree said at a press conference on June 25. “As fire units made their way to the third floor and to the reported location, it was noticed that the windows had been blown out of the affected unit. The sprinklers in the building had been activated and units were working to address water flow and had fire knockdown at 3:59. At 4.08, there were reports of shots fired. Two firefighters were shot.”Rosa, a 17-year veteran of LBFD, was shot while responding to reports of a fire and explosion in a high rise apartment complex that housed low-income seniors in downtown Long Beach. Rosa died from gunfire injuries he sustained while responding to the fire, and the second firefighter shot was Ernesto Torres, who is expected to make a full recovery. A third person, a resident of the building, was also shot and is expected to recover. Long Beach Police Chief Robert Luna said a resident of the building, Thomas Kim, 77, was arrested on suspicion of murder, two counts of attempted murder and arson. Luna said that the explosion, which knocked out windows, came from Kim’s unit in the building. “There’s still a large puzzle that we’re trying to put together and there’s a lot of information that we don’t know yet,” Luna said. According to a news release by the Los Angeles County District Attorney’s Office on Wednesday, June 27, Kim was charged with murdering Rosa and wounding two others. In the case, he was charged in total with one count of murder, one count of attempted murder of a firefighter, two counts of attempted murder and one count each of arson of an inhabited structure and explosion with intent to murder. He also faces a special circumstance allegation that the murder was committed while a firefighter was on duty. “Prosecutors said Kim allegedly had been feuding with a woman who lived above him and set off an explosive device on June 25 in his apartment with the intent to kill her,” the release said. Long Beach firefighters responded to a fire at the 11-story complex on the 600 block of East 4th Street in Long Beach and after the explosion in Kim’s apartment, he “reportedly sat at the opposite end of the hallway from his apartment when Long Beach Fire Capt. Dave Rosa made his way down the hall, prosecutors said. Kim allegedly opened fire on Rosa, killing him, and then fired and wounded firefighter Ernesto Torres and another man who lived in the building, according to prosecutors,” the release said. If convicted as charged, Kim faces the death penalty or life in state prison without the possibility of parole. The case remains under investigation of the Long Beach Police Department. Rosa is survived by his wife, Lynley, and sons Alec, 25, and Samuel, 16, who live in San Juan Capistrano. “(Rosa’s) been with the department for 17 years, he’s a staunch family man, good husband, good father, a joy to be around; just a wonderful, wonderful person,” Duree said. Rosa was active in the San Juan Capistrano community, his family are members of the Mountain View Church and he is a former president of the San Juan Capistrano Little League. Todd Strane, immediate past president of the SJC Little League, said Rosa was a current member of the league since he joined nearly 9 years ago. Strane said during Rosa’s time with the Little League, he served as president, umpire-in-chief (in charge of all of league’s umpires), board member, manager and coach. Rosa’s son, Sam, just aged out last year and is currently attending Saddleback Valley Christian High School. According to the SVC roster on www.maxpreps.com, Sam continues to play baseball. “(Dave) was always easy-going, cordial. He was always caring for the kids, caring for his son,” Strane said. Todd Radarmel, pastor of the Mountain View Church, echoed Strane’s sentiments and said that Rosa was a genuine person who people looked up to. A small close-knit community, Radarmel said the Mountian View Church is mourning for Rosa’s death, and are trying to help the family in any way possible. Radarmel said there will be a service for Rosa on Saturday at the church, but it is not yet determined if the service will be open to the public or not. San Juan Capistrano City Councilmember Derek Reeve took to Facebook to give his condolences. “This was truly a senseless tragedy. A San Juan Capistrano resident, parishioner and volunteer. Also to the very end, a dedicated public servant. R.I.P. Capt. David Rosa,” Reeve said. Strane said that Rosa will be remembered in the community forever. “He was always giving his time. He didn’t even have a son in little league this year, and he was still participating and seeing how he could reach out and help. He was always contributing,” Strane said. There will be a memorial tonight at 6 p.m. in honor of Rosa at Cox Sports Park, prior to the Little League All-Star Game, which starts at 6:30 p.m. Cox Sports Park is at 27623 Crown Valley Pkwy., Ladera Ranch. The game is at Field 4.